Thank you to all who stood with our community for our annual Yom HaShoah Commemoration, Rededication to Resiliency, this Sunday. Click here to read the Boston Globe's coverage of the event. Rabbi Turetz has enriched Temple Emeth as its spiritual leader since 1977. Graduating as valedictorian of his class from Adelphi University, he received his master's degree in Hebrew Literature from the Jewish Theological Seminary of America, where his rabbinic ordination was conferred with high honors. He subsequently received as well an Honorary Doctorate from the Seminary. 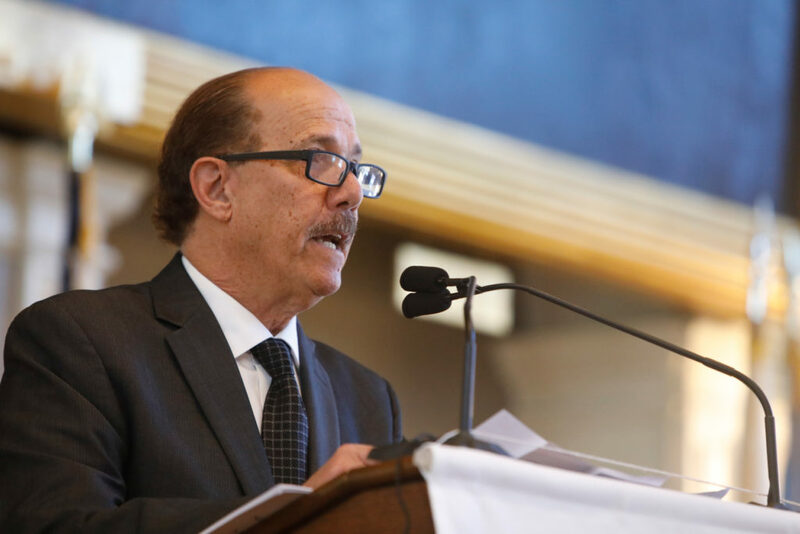 During his more than thirty years on the bimah at Temple Emeth, Rabbi Turetz has been an inspirational and highly esteemed leader of Boston’s Jewish community. He has served as president of both the New England Region of the Rabbinical Assembly and the Massachusetts Board of Rabbis, as Rabbi for the New England Federation of Jewish Men’s Clubs, and has chaired the New England Rabbinic Cabinet for Israel Bonds. His incomparable sermons and mellifluous voice, whether for Shabbat or holiday services, are not to be missed. Esther Adler was educated in Germany, Israel, and the United States. She graduated from the Teachers Institute of the Jewish Theological Seminary of New York and taught for many years at the Midway Jewish Center Hebrew School on Long Island. In 1981, she was invited to join the Department of Education of the Jewish National Fund as its Pedagogic Coordinator. She held this position full time until 1987 and until 1997 as part time consultant based in Florida. Esther compiled and published stories of survivors of her Temple, lectures about the Shoah, and is the coordinator of the recently established Holocaust Learning Center of Temple Torah. In 2014, she published a collection of poems, “Nature Eternal”; in July 2017 she published “Best Friends: A Bond that survived Hitler," a novel based partly on her life. She is featured in the documentary “We are Jews from Breslau”, which was sponsored by the German and Polish Government. Esther Adler enjoys an active life at Orchard Cove, a Hebrew SeniorLife retirement community in Canton, where she continues to write poetry, teach Hebrew and Yiddish classes, and lecture regionally and internationally about the Shoah. Each year, JCRC offers students in grades 6-12 in the Greater Boston area the opportunity to write a 400-800 word essay on a theme relating to the Holocaust. Click here to learn more. Questions? Please email Emily Reichman.